Israeli forces shot dead five Palestinians Friday, four in Gaza protests and one in the West Bank, and Palestinian militants later fired several rockets into southern Israel. In Gaza, the deadly escalation followed two weekly protests along the perimeter fence with Israel that saw no fatalities. The bloodshed is likely to complicate the mission of Egyptian mediators, who intensified their shuttle diplomacy to achieve calm and prevent a full-blown conflict between Gaza's Hamas rulers and Israel. Late Friday, Israeli army said 10 to 12 rockets were fired from Gaza into southern Israel communities. Israel's Iron Dome defense system intercepted several missiles, it added. 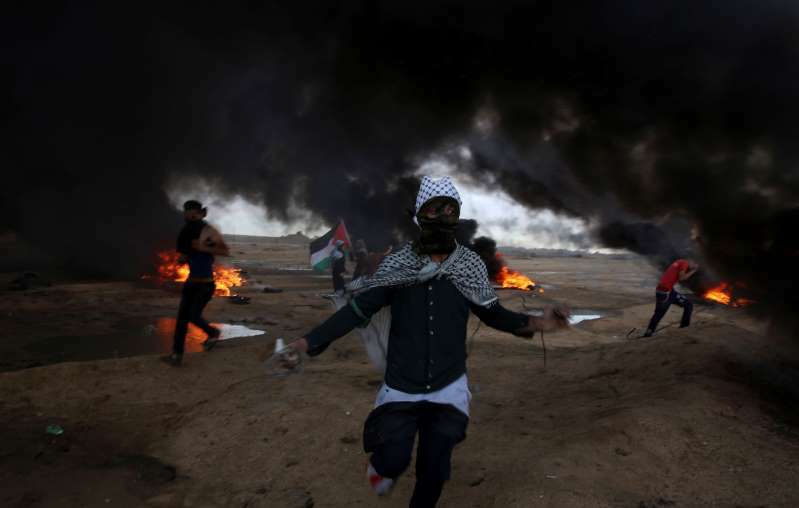 Earlier, thousands of Palestinians gathered at five locations along the boundary, burning tires and throwing rocks, grenades and firebombs at Israeli troops who respond with tear gas and occasional live fire. The Israeli army said some suspects briefly crossed the fence. In a separate incident, the military said its aircrafts struck three Hamas military posts in northern Strip. Three of the dead were reported in Khan Younis, in southern Gaza, according to the ministry. Witnesses said that dozens of protesters approached the fence there. The militant Hamas group has scaled down the deadly protests over the past two weeks as Egypt stepped up its efforts to secure calm. On Wednesday, Egyptian intelligence officials met representatives of Palestinian factions in Gaza. Loay Qarouti of the Popular Front for the Liberation of Palestine General Command said the mediators asked them "to protect the lives of protesters and minimize losses among them." Egypt wants calm restored to achieve national Palestinian reconciliation between Hamas, which seized Gaza in 2007, and the West Bank-based administration of President Mahmoud Abbas. The blockade has made it increasingly difficult for Hamas to govern. Widespread desperation among Gaza's 2 million residents — who get only a few hours of electricity a day and undrinkable tap water, in addition to suffering from soaring joblessness and limited freedom of travel — fuels their participation in the Hamas-orchestrated protests.